I'm a head covering, home-keeping old fashioned woman stuck in the 21st century. This is the journal of our home here in the Upper Ottawa Valley. Wow, yesterday was crazy. Cooking everything at home and then getting it down to my SIL’s for supper. But so worth the trouble. Our BIL was so happy to get some real food after having to eat hospital ‘food’. I think it perked him up having company too. For Crafting On/Yarn Along I finally finished Ella’s socks . Just waiting for some sunshine so I can sew in the black ends. I need to give in and get bifocals because my eyes are starting to interfere with my knitting and sewing. They are a lot more neon in real life. 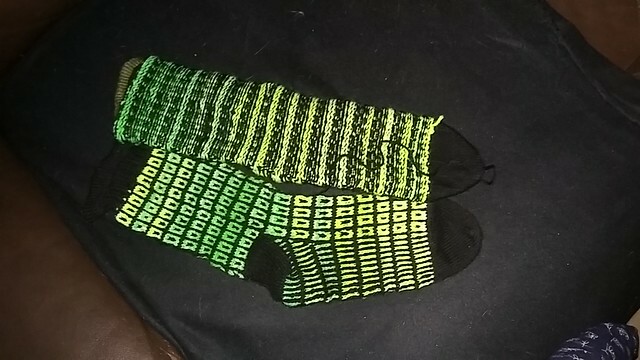 I’m almost done Mom’s other socksbut didn’t bother to pull them out for a picture. I’m sure they will be done by next week, so I’ll show you then.